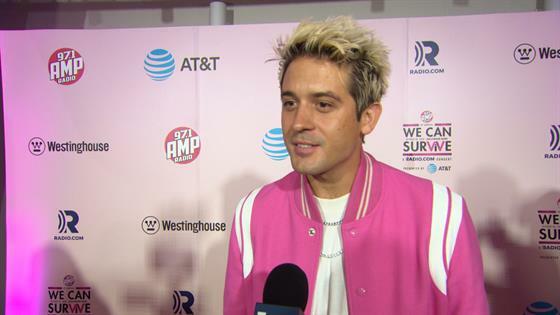 G-Eazy has no limit when it comes to gushing about his talented girlfriend, Halsey. Since the rapper started his working relationship with the singer last year, which later turned into a romantic relationship, he has spent a fair amount of time collaborating with Halsey in the studio. And at 97.1 AMP RADIO's 6th Annual We Can Survive concert, the artist spoke proudly of his girlfriend's artistic expertise. "I mean she's an incredible artist," he boasted to E! News. "She's really inspiring to watch work." G-Eazy added, "I've been blessed and fortunate enough to get in the studio with a lot of artists I admire, but she's one of those that when you hear her voice come through live from the booth, it hits you right away. It's pure." Together, the pair put out the hit song, "Him & I," which makes reference to the infamous criminal couple Bonnie and Clyde. At the 2018 American Music Awards, Halsey revealed it was their duet that led to them falling in love. "We're always in the studio, always working together," she said. "It's one of the reasons why we fell in love, 'cause we're huge fans of each other." And although the two briefly split, it looks like the pair's relationship is better than ever. The duo recently returned from a celebratory trip to Italy, where they honored Halsey's 24th birthday. G-Eazy honored his girlfriend with a touching post that read: "Happy birthday to this one. I love you so so so much and I always will. I myself, along with millions and millions of other people appreciate you more than you'll ever know. You're the brightest star in the sky. So grateful to get to travel thru life with you, so happy to call you my queen." Their shared love was more than evident at Post Malone's AMA's after party, where an E! News source spotted the duo packing on the PDA.